Имате въпрос към Guest House Taiko-Ya? Guest House Taiko-Ya е предпочитан както от пътуващите по работа така и от туристите заради качествения и удобен престой, който предлага квартал култура, пазаруване, разглеждане на забележителности на Киото. Само на 1. Km от градския център- това стратегическото местоположение на хотела гарантира на гостите си бърз и лесен начин за достигане до интересуващите ги точки на града. С удобното си местоположение хотелът предлага лесен достъп до всички градски забележителности, които задължително трябва да се видят. Възползвайте се от богатството на ненадминатите услуги и удобства в Киото. Безплатен WiFi достъп във всички стаи, магазин за смесени стоки, съхраняване на багаж, Wi-Fi връзка в общите части, семейна стая са само част от нещата, които отличават Guest House Taiko-Ya от останалите хотели в града. Хотелът се характеризира с 4 стилно обзаведени стаи за гости, в някои от които ще намерите достъп до интернет (безжичен), безжичен интернет достъп (безплатен), стаи за непушачи, климатик, отопление. Хотелът предоставя най-добрите съоръжения включващи градина, които ще Ви помогнат да отпочинете след активен ден прекаран в града. С превъзходните си удобства и отличното си местоположение Guest House Taiko-Ya е идеално място, в което можете да се насладите на престоя си в Киото. Съхраняване на багаж е на разположение от 08:00 - 11:00 ч.
От 12:00 до 16:00 ще се извършва почистване. Гостите трябва да бъдат извън обекта/стаята през този период от време. Настаняването се извършва между 4:00 PM и 8:30 PM. Гостите, които не се настанят в този период от време, трябва да се свържат директно с обекта преди пристигане, за да бъдат направени алтернативни уговорки. 5 min walk from Karasuma Oike Station. 15 minutes walk from Shijo shopping street. The house is very old and authentic, although that also means the staircase and door frames are small and narrow. Security lock after 9pm and quiet zone in all rooms from 11pm. Pleasant hostel with Kyoto atmosphere. I have stayed in many hostels during my trip to Japan so I think I can give a frank review. Rude staff who don't value their customers. Limited facilities with ok Cleanliness. Too many rules to follow. Too many fines and restrictions. Not a single hostel I stayed in the rest of my trip was so bad, very very unpolite staff. Not a pleasant stay at all. Although, the guest house have a great household so you can enjoy it like you are st home but they are really strictly. Before checking in, time, if you come early you have to “wait outside” and after checking out, you have to get rid of yourself immediately. No flexibility. Location is good in central Kyoto which you can access to any atttaction places within 30 minutes by bus or bicycle. The bicycle rental is 750 Yen and you need to return it before 8pm. If you choose to go by bus you just need to buy Kyoto unlimited bus ride pass 500 Yen. If you want to have a feel of staying in Japanese traditional house i'd recommend this guesthouse but the owner is very strict. The living room is only available from 8am-11.30pm and there is few rules you have to follow. The owner actually celebrated the hostel's one year anniversary while we were there and we can see why. He was very helpful and friendly and allowed our friend to hang out in the common room during daytime hours. The room was a little cozy but very clean. Well located, close to the bus stop and not too far from the subway. Enjoyed the stay! Beautiful traditional style house with modern facilities. Well located. Friendly and helpful staff. Guest House Taiko-Ya is a very nice place to stay. It feels like living at home. The place is a little bit small but I like the design of the house. Every space can be useful. It's my first time to have such bad experience during my stay. I put my baggage at 8:30am, however, every guest have to check in during 4:30pm to 8:30pm, if not, there is penalty for you. It's very hard for me to arrange time to come back to the guesthouse all the time. The use of kitchen, living room, hair dryer and showers must be with 8am to 11pm. The staff are rude and impolite, I was totally unrespected. If I were you, I won't have come to stay here. Never and ever! I really wanted to love this place, but it is really more of a hostel, not a guesthouse. Walls are thin so if other guests are inconsiderate you will have a hard time sleeping. Also shower is located near downstairs room, and people are using it constantly. Only 1 shower for all guests so getting a shower when you want it is impossible. Can’t enjoy the garden view from room because it is actually a public hallway, which is stated on its website but not on third party booking sites. It is clean and the owner has done a great job in decor. Location convenient to subway. But saying that it is more of a hostel for younger crowd. Lovely and helpful stuff in all situations. Bus booking, recommendations where to eat local food and so much more. I really recommend this place, there is also a kitchen if you want to eat at home at night. The Inn is not that so clean especially the living room, where all the occupants have to meet and have their meal. There was one small table for all and not allowed to eat in the room. There was a noise at around 3:00 am that disturb all the guest. My expectation for the Japanese people is well disciplined when it comes to the holy hour or sleeping time. There was no direction provided on getting into the Inn. Example from the train station, on what exit to be used for easy access. I stayed 2 nights in the guesthouse Taiko-Ya and enjoyed it very much. The interior is very lovely and the place really cozy, the building itself is very old. It feels a bit like historic japanese movie setting. And I felt a little bit like a giant inside :-D so I would not recommend it, if you're like 2m tall or seriosly overweight, otherwise its fine! Other guests were mostly japanese, very nice and quiet. I've had a pleasant stay at this guest house. It is located close to Kyoto's main road so every high light is accessible by foot or by bicycle. You can rent these at the guest house for around 5 USD for a whole day. 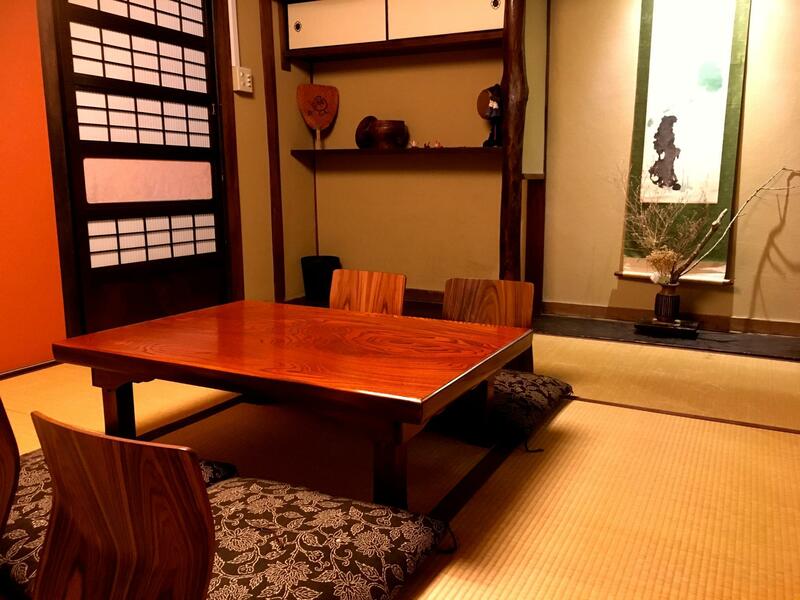 The interior of the guest house is typical japanese which makes the trip more authentic and fun. The staff was really friendly and helpful and overall I've had a great stay. The owner's attitude is very bad (probably mainly against Chinese nationality). He kept moving my luggage away from my bed without informing me. There is no such a rule saying that I can't keep my belongings next to me but he said there is such a rule in the dorm. 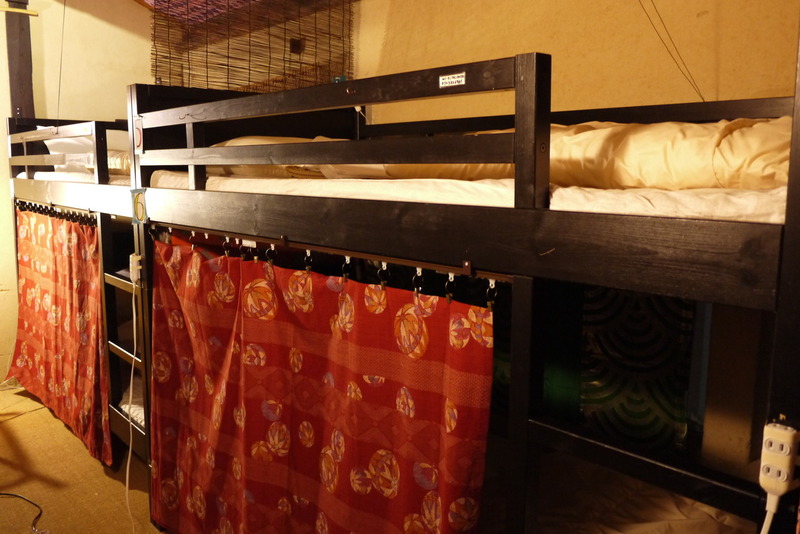 The female dorm(8 persons) is very small and messy, no window. And there is no lockers in such guesthouse. And the owner quarrelled with my friend and myself everyday (e.g. hotel closed from 12pm to 4pm), luggage not allowed to be put next to my bed, trash can't be put in certain bins). This is serious - My friend and I are going to Japan for travelling and for fun, not to create trouble or unhappinese. But this owner of the guesthouse kept creating troubles for us and make our trip very unhappy. If you are aiming for a happy trip, please try not to find this guesthouse. Except for the bad attitude of the owner, as I said the dorm is small but messy, no lockers, no windows. Ths is the worst dorm I've ever seen, much worse than the hostel I stayed in Penang and Phnom Pehn and Osaka (in terms of the dorm condition). And the location is a bit far from downtown subway (15-20 mins walk). Only one bathroom in the whole guesthouse. And 4 toilets sharing. I would not recommend this guesthouse to anyone, and I won't stay there again, esp the owner asked us to move out and find another hotel everyday. I loved Guest House Taiko-Ya. It is a tiny traditional Japanese house turned into a hostel. Everything has been well thought out and is extremely clean and comfortable. The staff were very accommodating and friendly, and helped us plan our stay in Kyoto. The bathroom was wonderful, although I must say that it wasn't that practical to have only one bathroom for the whole hostel. 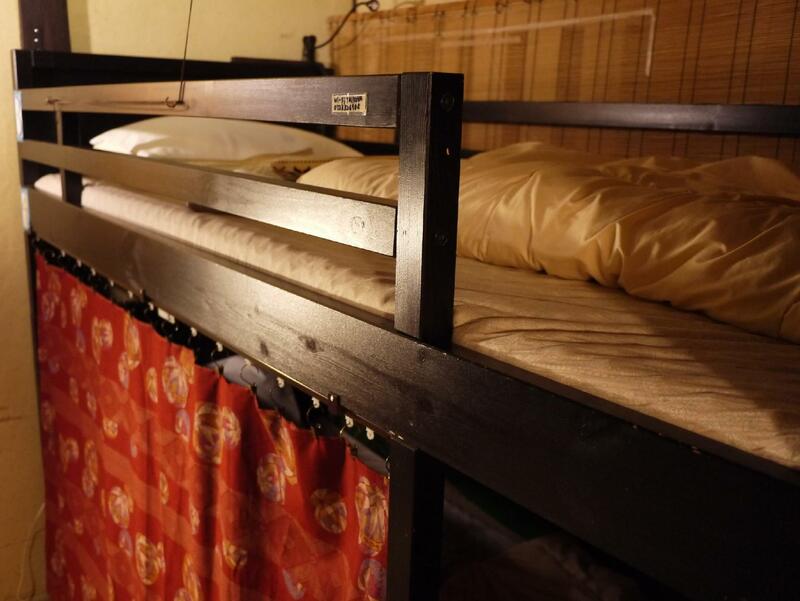 Overall, I would recommend this hostel to anyone wanting to experience Japanese culture in a friendly and cheap way! 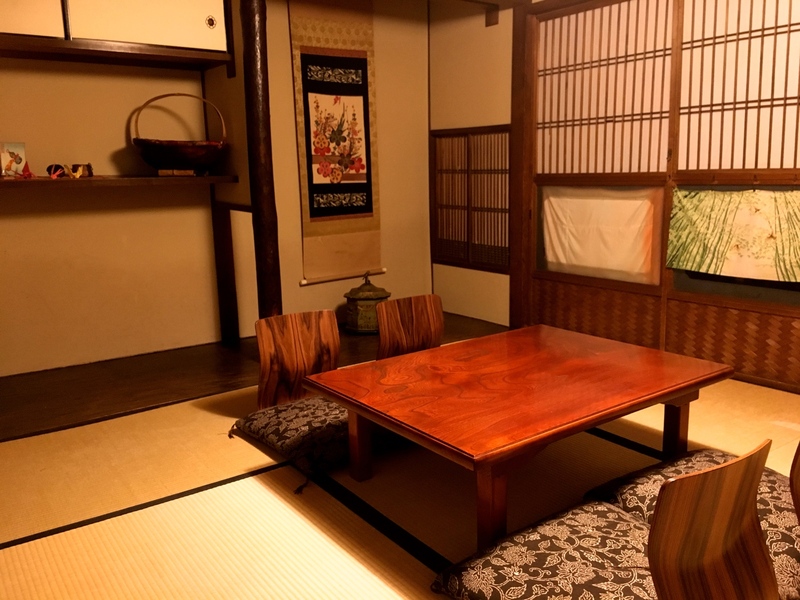 To experience the traditional japanese guesthouse, its good choice, nice room at the ground floor, nice kitchen, living room, especially, the garden which is located near the room on ground floor. the surrounding of the guesthouse especially at night gives us a quiet and peaceful feeling. awesome to experience somewhere different from a city. 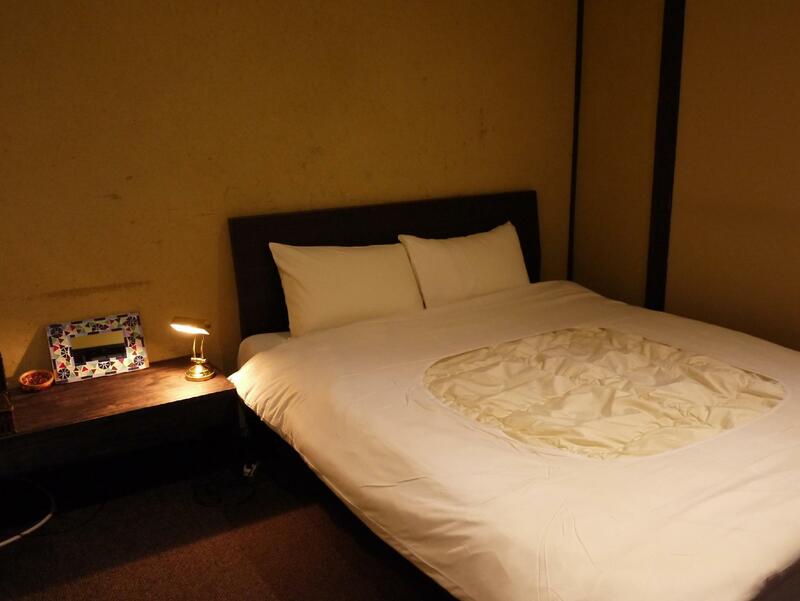 If you want to stay at the Kyomachiya in the city, you can reach that goal. You can experience the traditional wodden house. There are rooms with a beautiful garden and a Japanese style bathroom. You can taste the silence of Japan 'wabi' inside the house. However, due to the old structure, I stayed on the first floor, but as the guests on the second floor walked, vibrations were transmitted and it seems that it is not that big voice of the guest on the second floor, but the night when the talk is quiet is heard well. The next room, which was also partitioned by a shoji and curtains alone, was a comment room, an entrance to the second floor. Guests kept the house rules well, so the speech never leaked from 7 o'clock to 23 o'clock in the use hours. However, the staff was playing music in the hall early in the morning, but there was nothing other than noise. There are many Kyotoly eateries nearby. Traffic is at a central location where you will not mind going anywhere.